According to court documents, the government's "complaint will allege that Tetra Tech presented false claims to the United States in connection with its role at Hunters Point Naval Shipyard, San Francisco, California, in testing soil and scanning buildings for the purpose of radiological remediation." The U.S. Navy recently received more than $60 million in federal funding to help pay for chemical and radiological testing at the decommissioned Hunters Point Naval Shipyard in San Francisco. The new funding comes amid claims that much of the previous testing, overseen by a private engineering firm, had for years been conducted fraudulently. Recent audits by the Navy, which operated a base at the shipyard and is overseeing remediation efforts, found that as much as 97 percent of testing data produced by Tetra Tech EC, the civil engineering firm that's led cleanup efforts at the site for almost a decade, may have been compromised. In May, two former Tetra Tech supervisors who oversaw testing of soil contaminated by radiation were sentenced to eight months in federal prison after pleading guilty to falsifying documents and swapping out dirty soil samples for clean ones while working at the site in 2012. The firm, however, insists the fraud was isolated to those specific employees. After public pressure this summer, the Navy, which still owns the land, agreed to re-evaluate the area known as Parcel G, where some of the earlier testing had been done. “These funds will ensure that every area touched by Tetra Tech EC will be retested and the health and safety of the Bayview-Hunters Point Community will be protected,” congresswoman Nancy Pelosi said in an announcement on Monday, referring to money made available in a recently passed federal spending bill. The Navy is going through a draft proposal process for how it plans to conduct the retesting of the 40-acre Parcel G land. Final plans are expected later this fall. The former shipyard served as the site of a nuclear defense laboratory and a military maintenance shipping dock from the 1940s to the late 1960s. Historical records show that the area was polluted with heavy metals and radioactive waste, which has never been completely cleaned up. The Navy ceased operations at the shipyard in 1974. After briefly leasing most of the land to a private ship repair company, it closed down the facility in 1991, transferring operation of it to the City of San Francisco for redevelopment. 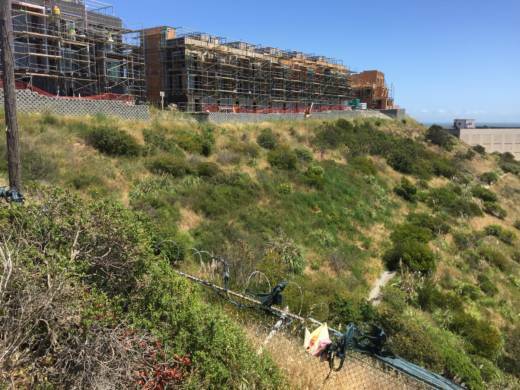 Parcel A, the first piece of land transferred, is a 75-acre lot on a hilltop overlooking the shipyard. Since then, a number of town houses and condominiums have been built there, and many more are planned. Last month, during a rescanning of Parcel A, state regulators found a token-size piece of naval equipment containing radium near the newly built homes. Kimberly Ostrowski, director of the western Navy Base Realignment and Closure, told San Francisco supervisors at a hearing this month that the object was removed and wasn’t dangerous to the public. “The deck marker measurements as it was found are less than radiation from a dental X-ray or a transcontinental flight,” she said. The Navy has long tried to persuade residents that Parcel A is safe. But at a recent informal gathering in someone's garage, homeowners expressed major concerns. “Is the foundation of my home thick enough to protect me and my family from any radiation that might be coming from the ground?” one resident asked. The small meeting of about a dozen residents was led by retired nuclear policy expert Daniel Hirsch, a former UC Santa Cruz lecturer. He wrote two papers recently that suggest the Navy did not adequately test Parcel A, as well as most of the rest of the shipyard. Hirsch's argument is based on a historical radiological assessment (HRA) published by the Navy in 2004. Of the 882 historical and current sites at the shipyard, 91 were identified as radiologically impacted to some degree, according to the report. "This does not confirm the presence of radioactive contamination, but does indicate that there is the possibility for residual contamination,” the report stated. Hirsch said because of the historical uses of the shipyard and the past nuclear activity there, he doesn’t think it’s possible that only 91 of the sites could be considered potentially contaminated. In a statement, the Navy said it disagrees with Hirsch's conclusion. “We weren’t expecting this to be something we had to deal with,” said Linda Parker Pennington, who recently bought a house at the shipyard. "We trusted the sales people that they wouldn't be building on a toxic site that hadn't been cleaned up. If we had talked to other people who had been dealing with this issue for decades and bringing it up, then we might have been more concerned." There will be an information booth about the cleanup at a health fair Saturday (Oct. 27) at the Southeast Community Facility Commission, 1800 Oakdale Ave., according to the Navy's website.